Get the facts about marijuana and dispel the myths about pot. Facts about marijuana tells you that this drug is not as innocent as many people believe. The fact that pot is not addictive is a myth. Another myth is that it’s harmless – not so. The amount of carcinogens in 5 joints is equivalent to smoking a pack of cigarettes a day. Many pot smokers also smoke cigarettes. So what are they doing to themselves? Think about it…. Pot is the most illegally used drug. It comes from the hemp plant and the active chemical is THC (delta-9-tetrahydrocannabinol). There are other chemicals in the cannabis plant – around 400 or so-- but THC is the one which has the most effect on the brain. There are short term and long term side effects of marijuana The plant usually is rolled into a cigarette (joint) mixed into food (like brownies) or brewed into a tea. There are also ‘cigars’ (blunts). Pot can also be smoked in a water pipe (bong). We have cannabinoid receptors in our brains that lead to the ‘high’. The most receptors are in the pleasure centers, memory, thoughts concentration, sensory and coordination areas of the brain. So this is the reason that weed causes distorted perceptions, coordination problems, difficulty in thinking, and problem solving, problems with learning and memory. 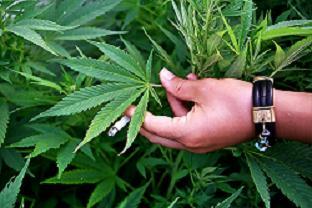 Pot smokers report that it’s difficult to quit smoking marijuana. They feel irritable, have insomnia, decreased appetite, anxiety, and get cravings to use. Withdrawal symptoms start within 1 day of abstaining and peak in 2 or 3 days. Within 1 -2 weeks, the symptoms subside. So if you’re intending on quitting, hang in thereHere are tips to help you quit. Chronic use increases anxiety, depression, suicidal thoughts and schizophrenia. We do not know if marijuana causes mental problems, exacerbates them, or is used to self-medicate the symptoms that were already there. However, we know that in high doses, pot can produce acute psychotic reaction. Pot smoking has 50% - 70% more cancer causing hydrocarbons than tobacco smoke. Users inhale more deeply and that increases the lungs’ exposure to the smoke. Smoking weed creates problems in daily life. If there were problems that existed prior to smoking, they simply become worse. Studies have shown that smoking pot increases absenteeism, lateness, accidents, workman compensation claims and job stability.